Cereus, hylocereus undatus, fully open in the early morning. The white bloom itself is the size of a dinner plate. It’s crown of platelettes is an additional round placemat size structure. Overall, what you see is about 16 to 18 inches across! Do you like exotic fruit and flowers? 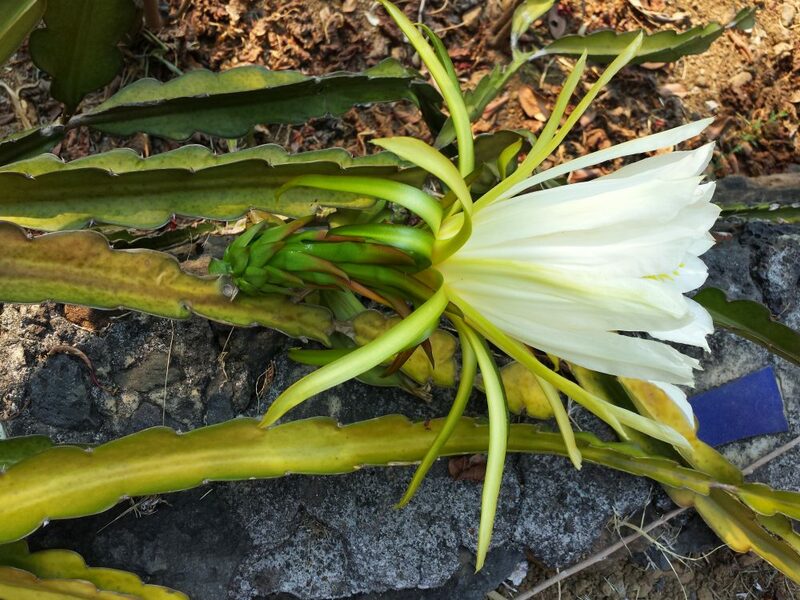 Meet a species of the cereus cactus with fruit straight out of a Jim Woodring cartoon and very large white flowers that bloom for just one night. 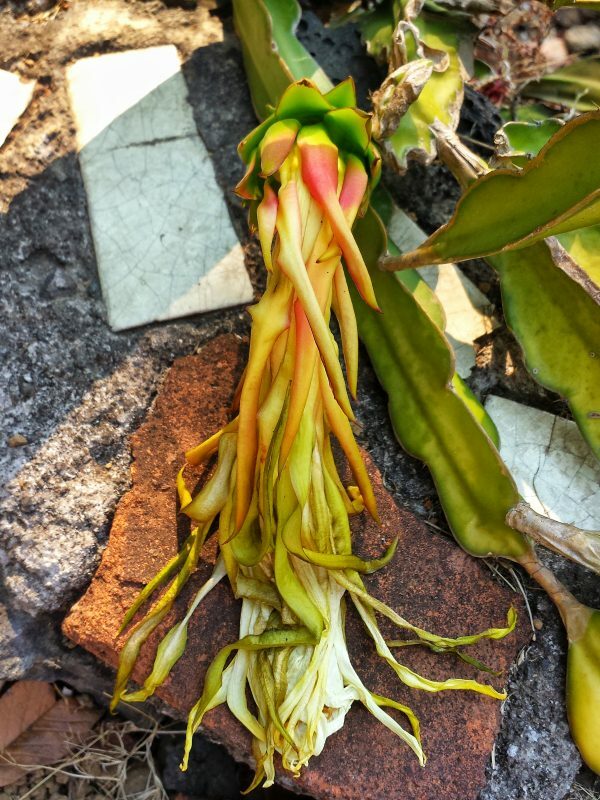 This cereus, hylocereus undatus, is a scrawny looking cactus with long, gangly, snaky branches. The branches are trifold, meaning they are flat and with three angles – if you cut the branch it is a 3 pointed star just like the Mercedes logo. Younger plants have just flat branches, and wild specimens are often joined by thin, green or brown with bark, branchlets. The gorgeous, huge blooms appear just once or twice a year and open for a single night to attract pollinating moths. 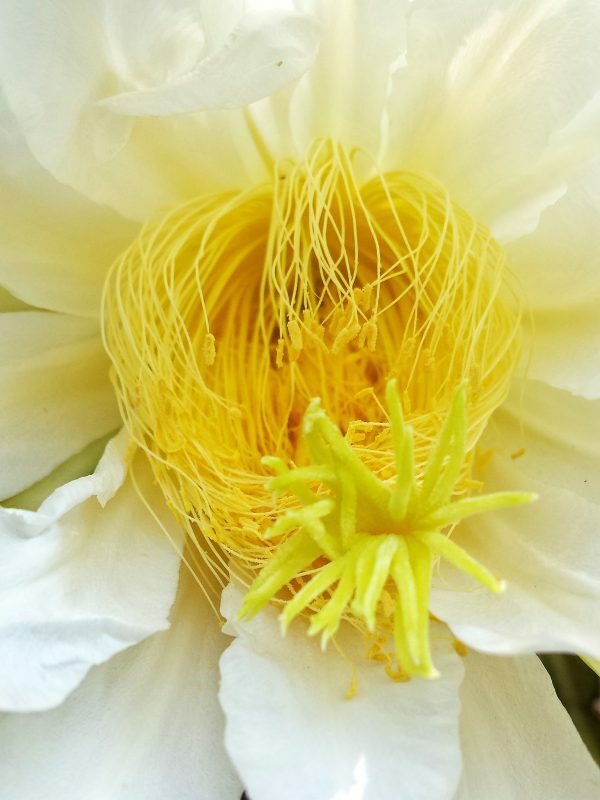 A native from Mexico to northern South America, this cereus is now found in tripical and subtropical parts of the whole world. Its flowers are among the largest of all flowering cactuses. And it gives us dragonfruit! Read on to learn more about this fascinating plant. When moths are attracted to the sweet smell and the large white petals that reflect the moonlight and venture into the bloom, the inner web of fibers makes sure that every visitor leaves well coated with pollen. 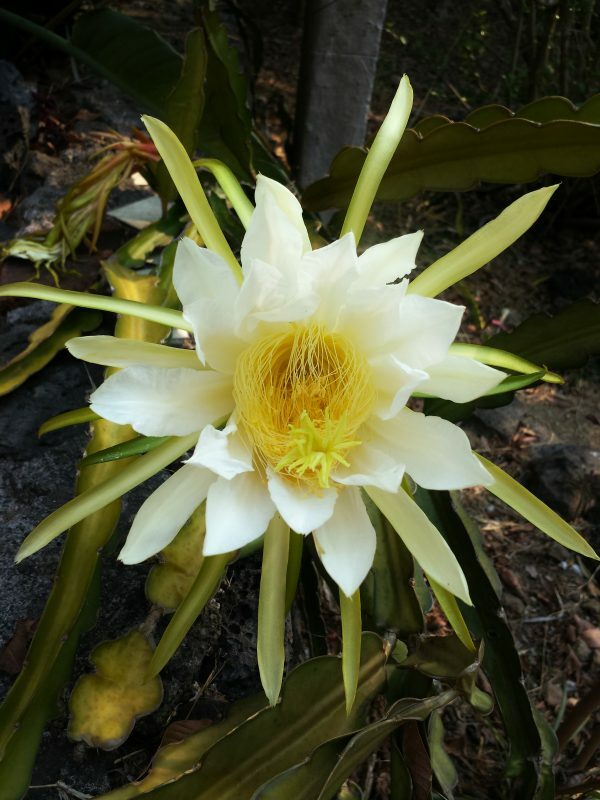 The very large, elegant flower is attached to a scrawny stem of cactus that scrambles over the ground and props itself up on any rock or tree it encounters. A bloom 24 hours later. From flower base to tip, this bloom closed in death is about 12 inches long.